How does building air conditioning have to be carried out in a large production facility to achieve a temperature stability of 1.5 Kelvin? Where and how do we have to cool to compensate for the waste heat of the machines? Ensuring the temperature stability through flawlessly built air conditioning in a production of aircraft components to ensure the tolerances in mechanical machining. Our client was commissioned to supply the building technology for a new production site. Much was standard for him, but some specifications were demanding. For example, it must ensure a temperature constancy of 1.5 Kelvin up to 5 meters high throughout the production. If it fails, the parts have the wrong temperature, and the tolerances cannot be adhered to. 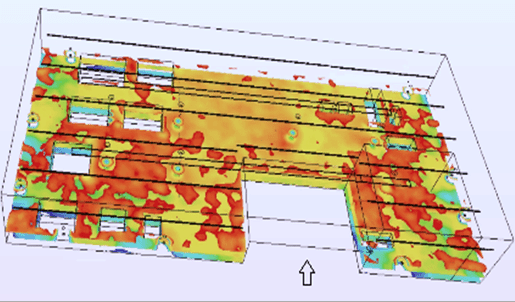 With a large and comprehensive flow simulation, we have visualized the entire building air conditioning with airflows in production. It is easy to set up the energy balance of the system: the sum of the waste heat must correspond to the sum of the cooling capacity. However, to design this spatially and temporally so the temperature is kept perfect requires much more knowledge about physics.The model included all heat sources (machines, solar irradiation etc.) and heat sinks (floor cooling, air supply, and outlets etc.). This resulted in a quantitative evaluation of the status quo. In the second step, we optimized it with the plant planner, so the second calculation run showed it will go! Our client realized the construction and knew he would not experience any nasty surprises during commissioning.